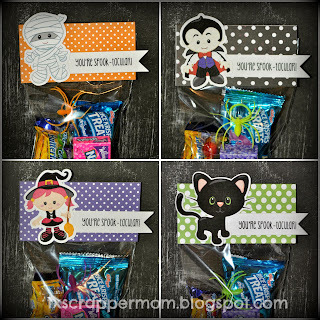 I have 16 first graders in my homeroom, and I wanted to do something special for each one for Halloween - YES! I'm THAT teacher! I made some treat bags using my new clipart (how cute are these images?!). I wanted to use all the colors of Halloween - so I didn't get bored by the last one. Out of all the treat bags I made, these are definitely my favorite (and I made A LOT)! !